“How do you show appreciation? Appreciation is an emotion. It’s a feeling. You can’t draw a picture of it. Why do people want everyone to act just like they do. Act like they do. And if you don’t — If you don’t, people make the assumption that you do not feel what they feel. Anything But Typical by Nora Raleigh Baskin, a Schneider Family Book Award winner, is wonderful in a confusing sort of way. It’s a story for adolescents written from the perspective of a 12-year-old on the autism spectrum. It addresses friendship, outbursts, sensory issues, family dynamics and a boy’s first crush. “…He is laughing more. Louder. ‘You want to know what her name is?’ he is saying. …My hair hurts. My chest is tight. ‘I bet her name is Retardo Girl,’ the boy says. No, I am thinking. Her name can’t be Retardo Girl. And then I figure it out. He is just being mean. When a dog gets mean and bites a person, it’s the law that they have to put that dog to sleep. This boy is being mean. He is lying. He doesn’t really know PhoenixBird. I have nothing to worry about. For some reason my head is still shaking. This isn’t a pity party or some veiled attempt to explain to neurotypicals (NTs) what it’s like to have autism– although I think it does. There was no way to stop all the molecules that started penetrating my skin. My hands flew off my body. My body flew into a million little pieces. Anything But Typical is a story in its own right whose main character is an individual with his own history, his own likes and dislikes, his own wants, tastes and fears. It’s given me some insight into my 10-year-old and cautioned me about making emotional demands. I wouldn’t say that Anything But Typical is a must-read– but, it’s a good read that made me think. Please be patient with my limited vocabulary. It’s hard for me to tell you what I need when I don’t know the words to describe my feelings. I may be hungry, frustrated, frightened or confused but right now those words are beyond my ability to express. Be alert for body language, withdrawal, agitation or other signs that something is wrong. Or, there’s a flip side to this: I may sound like a “little professor” or movie star, rattling off words or whole scripts well beyond my developmental age. These are messages I have memorized from the world around me to compensate for my language deficits because I know I am expected to respond when spoken to. They may come from books, TV, the speech of other people. It is called “echolalia.” I don’t necessarily understand the context or the terminology I’m using. I just know that it gets me off the hook for coming up with a reply. Being patient doesn’t mean being complacent. In Autism there are tight ropes to walk on all kinds of issues and increasing vocabulary is certainly one of them. My son J borrows a lot of words. 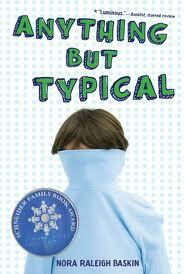 In another book I’ve recently read, Rulesby Cynthia Lord, the main character has a younger brother with Autism. She understands that he has a lot of rules and she helps him remember and abide by those rules. One that really hit home with me is “If you don’t have the words you need, borrow someone else’s.” Technically– in therapist speak– it’s called Echolalia. While it’s important to find your own voice– your own words. Effective communication can occur by borrowing other people’s (movies, books, songs) words. In our house there is a lot of movie quoting. My husband and I both work to keep up with the movie du jour so that we can fill in any blanks left by what J tells us. He works hard to participate in conversations and other social settings. He understands that he is expected to be a part of the group and he works to do so. He also has come a long way in appropriately using movie talk. It’s so important to encourage positive social interactions and meaningful communication. Sometimes we focus on one, sometimes the other. In social settings we work to help him feel good about taking chances– confident enough to try. My parents raised me to be independent in both thought and action; we’re doing the same for J, so fitting in isn’t the issue– relationships, comfort, self esteem is what matters. When J was first working on spoken language we demanded that he use the word. If he didn’t know it we provided it to him and he had to repeat it. Then, we started adding on– Crackers. Want crackers. Want crackers please. Want Club crackers please. I want Club crackers please. Can I have Club crackers please– thank you. This didn’t happen in weeks– really about a year– and, with lots of meltdowns! But we got through it and, he’s better off for the work he put in. Frustration over lack of vocabulary can lead to huge, horrible meltdowns so it’s important avoid them in social settings. But, it’s also important to slowly and consistently push the limits– just a little… just enough. You know your child, you know what takes things too far and you learn how to avoid allowing things to get out of control. Trust your instincts and be patient with your child’s limited vocabulary. Also– do not forget that Autism is a spectrum. What works for one child may not work for any other child on the whole spectrum. Trust your instincts. Idioms, puns, nuances, double entendres and sarcasm are lost on me. This has been a real stumper for me– and for my parents. Having grown up overseas, I don’t use a lot of slang in English but, I do joke around a lot. J is into Pirates these days– specifically; The Pirates Who Don’t do Anything. He’s a little actor, and his primary method of communication is Echolalia– so, when he’s quoting the movie in the voice of Sedgewick, it’s pretty natural for me to call him Sedgewick– he corrects me every-time: “I’m not Sedgewick; I’m J.” His language is literal. It’s important to say what you mean– precisely what you mean. It doesn’t rain cats and dogs; it rains really hard. He isn’t my “Honey Bunny”; He is my favorite guy ever. He dog isn’t “acting up”; He’s being naughty. When I realized that J didn’t understand my tone of voice it was a major adjustment for me and I started announcing when I was asking a question. It’s my habit to get his attention– “Question” (In the inflection of a question– if he doesn’t look at me I tell him to look at me) “J do you want to go to the store with me?” This has been so helpful for us. He knows when I ask a question– he has to respond and he does. This is important: When giving instructions you have to be specific. Seriously– this will reduce the number of meltdowns, get results faster and correctly. Don’t tell him to clean up the mess– tell him to put his toys in his toy box and the dirty clothes to the laundry. Keep promises. Your child needs to be able to believe what you tell him– literally. If you say you are leaving in five minutes: Leave in five minutes. I’ve quit giving a time-frame because it’s just too hard to keep in a social situation; instead, I tell J what has to be done before we can go. “I need to finish helping grandma with the dishes. When I am done we can go.” Or; “Pack up your toys, Get your coat and give everybody hugs and kisses then we will go” I always make sure he is looking at me when I tell him what needs to be done and, I always keep my promises. I really do recommend reading this book– it’s been so helpful for us– No meltdowns this week! Please remember to distinguish between won’t (I choose not to) and can’t (I am not able to). It isn’t that I don’t listen to instructions. It’s that I can’t understand you. When you call to me from across the room, this is what I hear: “*&^%$#@, Billy. #$%^*&^%$&*………” Instead, come speak directly to me in plain words: “Please put your book in your desk, Billy. It’s time to go to lunch.” This tells me what you want me to do and what is going to happen next. Now it is much easier for me to comply. How easy it is to forget that our children hear differently than we do! It’s work to communicate with them– but, it’s much more work for them to listen/communicate with us… And, the payoff is worth the walk across the room, the insistence on eye contact, the demand for a response. Last night J was “off.” He wasn’t in tantrum mode but was extremely disconnected. He laid around, he didn’t want to eat, he didn’t connect with me when I spoke to him. His usual happy, singing, funny self was tired. But, when I tucked him in, took his face in my hands and told him that I love him– he told me that he loves me too. That’s the pay off. That’s what makes all the work worth the hardship. My heart breaks for parents who’s children have never said those words. J was five before he said them… and I still remember like it was today. Don’t give up… Don’t ever give up! Remember– it isn’t that your child won’t– they can’t. My hearing may be hyper-acute. Dozens of people are talking at once. The loud speaker booms today’s special. Muzak whines from the sound system. Cash registers beep and cough, a coffee grinder is chugging. The meat cutter screeches, babies wail, carts creak, the fluorescent lighting hums. My brain can’t filter all the input and I’m in overload! My sense of smell may be highly sensitive. The fish at the meat counter isn’t quite fresh, the guy standing next to us hasn’t showered today, the deli is handing out sausage samples, the baby in line ahead of us has a poopy diaper, they’re mopping up pickles on aisle 3 with ammonia….I can’t sort it all out; I’m too nauseous. I believe that J will be a productive part of society and this book– the information in it– is a stepping stone. I highly recommend it to all who live with Autism– parents, teachers, grandparents, ministers, Sunday school teachers, lifeguards at the Y… It is up to us– the guardian’s of these kids to provide the people in their lives with this information. An article by the same name is available on-line. Categories : ASD, autism, Books, Grandparents, SDD, Sensory Disintegration, Treating Autism, What Causes Autism? I am first and foremost a child — a child with autism. I am not primarily “autistic.” My autism is only one aspect of my total character. It does not define me as a person. Are you a person with thoughts, feelings and many talents, or are you just fat (overweight), myopic (wear glasses) or klutzy (uncoordinated, not good at sports)? As an adult, you have some control over how you define yourself. If you want to single out a single characteristic, you can make that known. As a child, I am still unfolding. Neither you nor I yet know what I may be capable of. Defining me by one characteristic runs the danger of setting up an expectation that may be too low. And if I get a sense that you don’t think I “can do it,” my natural response will be: Why try? In the First Chapter she talks about predispositions we have towards labels. Last weekend my son got a new Sunday School teacher. She is a lovely older lady who really wants to help J. She sat in on his old teacher’s last class with him and afterwards commented to me that she was really surprised by how well J did. I sang his praises– he’s a great reader, he’s really sweet and funny, etc. After reading the first chapter of this new book it occurs to me that she had a set of stereotypes she was anticipating she’d have to deal with. (Bless her willingness to teach him anyway!) Because of her willingness to tackle this class and her predisposed notions, she will be able to learn from him. He will make her life richer. I know that I sometimes clarify– “you know J is autistic”– I don’t introduce him as autistic but I do use it as a crutch to explain why he is how he is. 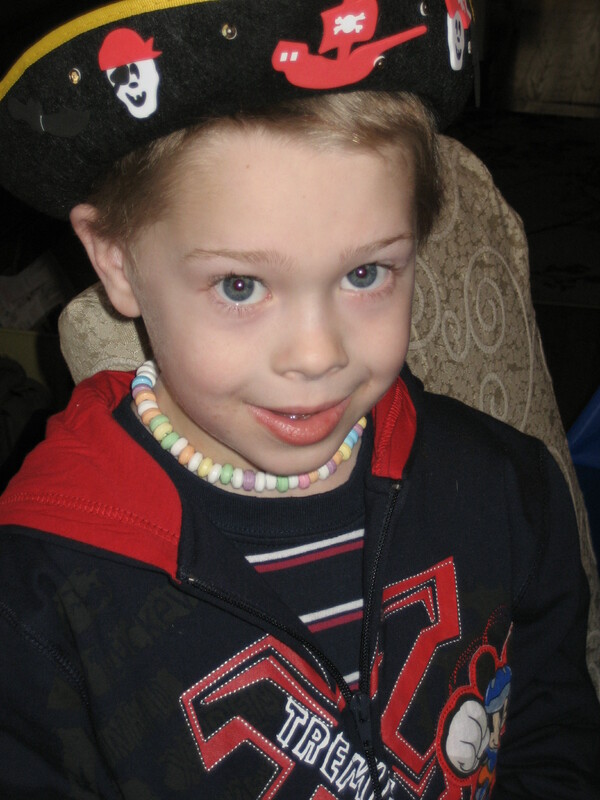 I need to give him more credit and remember that he is first and foremost a child– a georgeous, funny, sweet child! I am truly blessed by Autism– strange, huh? J is who he is because of Autism and I am so lucky to be his mom! I certainly don’t mean to be a Pollyanna– there are challenges– REAL challenges but, I wouldn’t trade him in… He is working hard to overcome his challenges, he tries– he’s a good boy who has to deal with things that I can’t relate to and in-spite of it; he is cheerful and persistent. My son will overcome his speech and social issues. He will find a place where he will be a productive member of society. He will– and, I’ll help him. Categories : autism, Books, Treating Autism, What Causes Autism?